The region of Eastern Mediterranean (EM), a meeting point of East and West, of North and South, of the three major monotheistic world religions included, constitutes in geopolitical terms a specific subsystem per se. At the crossroads of three continents, Europe, Asia, and Africa, the geopolitics of EM does not involve only regional actors but also actors placed along antagonistic concentric circles: the United States, the Russian Federation and the European Union. The region is also at the apex of two important geostrategic triangles, formed in the North and North-East with the Black Sea and the Caspian Sea, and in the South and South-East with the Middle East and the Persian Gulf. From 2008 onwards, the security and political order in this subsystem, existing since the onset of the Cold War, collapsed, due to the deterioration in relations between the USA’s two most capable regional allies, Turkey and Israel and the continuing fallout of the Arab Spring. It’s been replaced by a widening civil war in Syria and a geopolitical rivalry among Turkey, Israel, Cyprus and Greece and between Western countries and the emboldened powers of Russia and Iran. In the meanwhile, the EU-Cyprus-Greece-Israel energy cooperation was strengthened by Europe’s interest in the diversification of routes and sources of gas supplies (EU Second Strategic Energy Review, 2008) and the promotion of the Southern Gas Corridor Strategy (SGC). This strategy, was mostly triggered by the worsening Russia-Ukraine relationship in 2006-2009 and the Kremlin’s decision to annex Crimea, legally making part of Ukraine (early 2014). “The Eastern Mediterranean’s New Great Game over Natural Gas”, Stratfor, 22 February 2018, p. 12. The US and Russia, respectively the world’s largest and second-largest producers of natural gas, are both poised to play a vital role in brokering (and benefiting) from the coming “Eastern Mediterranean Game”. On the other side, both regional countries (with or without energy resources) and the European Union interest is to cooperate by utilizing the existing Egyptian LNG infrastructure for the export of EM gas. This would offer flexibility, as connecting offshore gas fields to existing LNG infrastructure could present a ‘cheap and quick solution’ as opposed to costly and long-term energy infrastructure. It could also provide the first opportunity to test gas cooperation between Egypt, Israel and Cyprus. That cooperation could eventually scale-up in the 2020’s should new gas resources be found in the region and should gas demand in export markets justify the construction of additional infrastructure, such as an Israel-Cyprus-Israel pipeline. 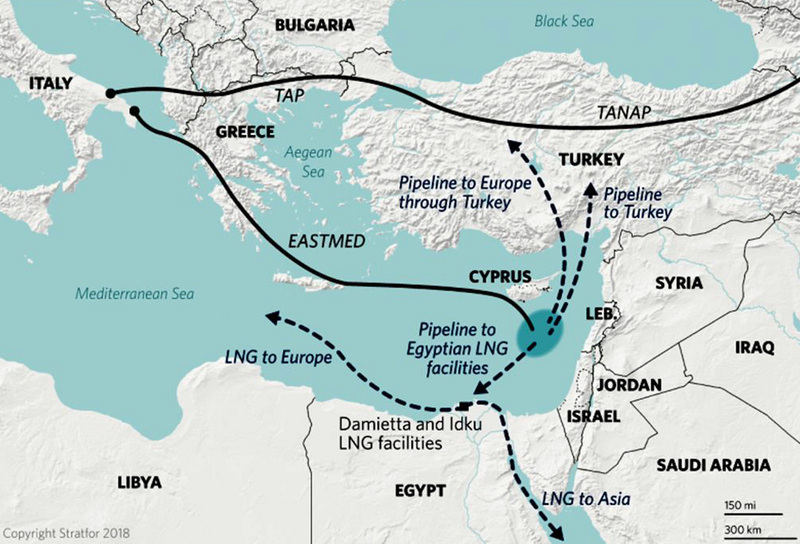 For the EU, the materialization of an Eastern Mediterranean gas hub (understood as a crossroads of physical flows, not as a trading platform) based on Egypt’s’ LNG infra-structure would be beneficial for both energy policy and foreign policy considerations, providing substance to the long-lasting EU gas supply diversification strategy and functioning as a catalyst for sensible regional dialogue, and most importantly keeping Russia away from acting as a political arbiter for the whole region. Indeed, this scheme’s energy routing to the markets could help EU to avoid becoming hostage to either Russia’s monopolistic visions or Turkey’s regional aspirations.